Alexandria Ferguson grew up across the country, as her Dad was in the U.S. Army. She spent a lot of time in her hometown of Maumelle, AR. She graduated from University of Arkansas, and decided that Fayetteville was the place to stay and loves her Razorbacks. Alexandria is married to the love of her life and best friend, Joe Ferguson. They have 2 children, Julianna and Brooks, 2 Dogs, Chaco and Tok, and 2 Cats, Luna and Ruby. You will find her supporting her kids at their dance, wrestling, volleyball, football and baseball competitions. Alexandria graduated from the University of Arkansas with Bachelor of Fine Arts with a Design Emphasis. She currently serves Walmart as Sr. Manger or Content and Creative, managing Walmart’s brand and reputation. She has served as Interior Designer, Marketer, Creative Director, Product Developer and other various roles within Walmart, and supporting agencies and suppliers. In all capacities, her drive is in becoming a great story-teller, creating innovative customer solutions and building brand reputation. In addition she has served as Creative Director and Owner of Blu Designs, LTD. similarly. Alexandria joined the Junior League of Northwest Arkansas with the 2006 New Member Class. She has served as Vice Chair of Marketing and Chair of Public Awareness and League Messaging. She has served on the Winter Dreams Committee and the inaugural Touch-a-Truck Committee. 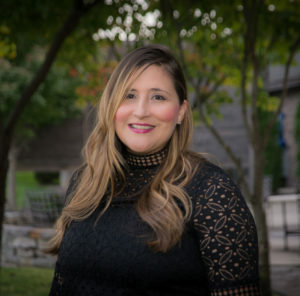 She developed for such JLNWA campaigns for Domestic Violence Awareness, Winter Dreams, Moonlight Masquerade, Purple for a Purpose 5K, Touch-a-Truck, Little Black Dress and JLNWA Connections Magazine. Alexandria has developed local non-profit marketing campaigns and collateral for events like, Tour De Cure and Kiss a Pig for the American Diabetes Association, Dancing with the Stars for the Amazeum, and Pretty in Pink for the American Cancer Society. She served as a volunteer for both in photography and in management for the inaugural Northwest Arkansas Fashion Week. She also served as President of the Northwest Arkansas Advertising Federation. She also served as Gamma Phi Beta Northwest Arkansas Alumnae Chapter. The Junior League has become a constant passion for Alexandria as it is a gateway to build a better local community. She feels that as a “local leaguer” our goal is to build awareness of the continually growing domestic violence issue and bring light to giving our community local solutions that can assist them.